Before I started to write the books, I thought I needed to ask people from small towns for ideas for advice. But I’ve discovered that to find quirks, all I need to do is look at my own family and friends. In fact, sometimes I can just look at the person in my mirror. Who turns up the volume of their car stereo and dances in the driver’s seat while singing loudly? Who keeps a secret stash of chocolate in their house? Who talks to their pets? Who kisses them and calls them sweetheart? Who has friends who are constantly late? Friends who gossip? Friends who keep dating jerks out of a deep sense of insecurity? Who knows their liquor store clerk well enough to… No, not me. Really. But the thing I’m getting at is people are odd whether they live in a tiny town, a big city, your house…or your head. As you can see, I have a lot of weird people in my head. Any quirks you’d like to add to the list? 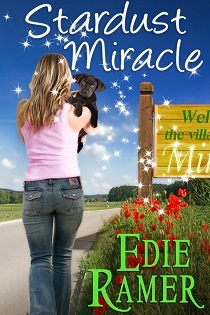 I’m giving away an e-copy of STARDUST MIRACLE to a commenter. Becky ran across the grass and laughed at her brashness. She wore her tan trench coat – her church coat – over her red negligee. Tonight she felt free. With a sexual appetite and playfulness she hadn’t felt for a long time. She couldn’t swear that what she planned had never happened in the church, people being what they were. But it had never happened in the church before with her and Jim. Laughter spilled out of her mouth, and she only stopped because she was breathless from an overload of excitement. The need to experience something more with her husband had been building inside her for a long time. Now it was finally boiling over – leaving her lightheaded and unlike her usual self. She liked these feelings. Liked this side of her a lot. When she’d stepped out of the car tonight and looked up at the stars, something happened. Something changed. For so long, she’d been carrying a dark weight around with her. Going through the days and nights trying to say and do all the right things, when inside something had felt all wrong. She’d lost the joy of life. Not fully living…just going through the motions. At only thirty-six, she’d felt old and dried up. Now she felt young again. Free. Jim wouldn’t know what happened to his proper wife. She reached the church’s back door, using it instead of the front entrance because she didn’t want anyone passing by to see her. Not that there was anything wrong with going to see her husband. But if anyone mentioned her late night visit, her face would probably turn the color of a ripe tomato and give away what they’d done. She slipped the key into the lock but it turned easily. She stepped inside. Jim must’ve come in this way and forgotten to lock the door behind him. He was always preoccupied with his work and his parishioners. She admired that. She did. But once in a while, she wanted his mind, plus a few body parts, to be on her. And not just when her body temperature was right for conception. She started toward Jim’s office, and her heels clicked on the linoleum floor. Laughing under her breath, she stopped and took them off. She wanted to surprise Jim with a good surprise. No. A wonderful surprise. His door was closed. Habit, she supposed, since no one was here except him. She heard him speaking. Couldn’t make out the words. Just his voice. Probably saying lines from the sermon he was preparing. Then his voice stopped, and she imagined him frowning at his computer screen while he wrote the next line. She started to undo the buttons of her coat, then decided it would be sexier to do it inside with him watching. Kind of like a stripper. Stifling a giggle, she turned the handle and flung open the door.